I've been feeling a little rudderless on the Heresy front recently. I really want to do more Thousand Sons, but I'm forcing myself to wait for the actual minis and rules, subseqently the Spireguard are also on ice (though I am picking up a Stormhammer for 'em at Gencon the end of the month). Recent events have meant I'm not really gaming anymore so it's pretty much all about the modeling and painting side of the hobby at the moment, and that means conversions and odd projects in my mind. Got the itch to do some kitbashing and with the release of Tempest there's a much more viable list to use to do the Geno Five-Two that has been bubbling away on the back burner. The intention is to do a 'historically accurate' selection of models taken from the book Legion - specifically Het Peto Soneka and the Dancers company just prior to their mauling at Tel Utan and elements of the Alpha Legion force that came to their aid (immediately following the Dancers being used as bait by said Astartes) - Because I'm a huge nerd I'm focusing on trying to make the force as 'historically accurate' (i.e. true to the book) as possible within the bounds of my admittedly meagre-to-middling modeling/sculpting talent. While the art on the front cover of the novel seems to suggest the infantry are dressed similar to the Vostroyans, there's no real indication that those men are supposed to be the Five-Two - indeed their description in the book is rather at odds with the cover (cool pic though it may be). I've been going through the novel and listening to the audiobook and taking notes on their description but the overview on Lexicanium covers all the main points - "The Geno wore a bulky-seeming uniform that nevertheless allowed them to operate with some grace of movement. A thick leather and armourchain bodyglove formed the main item of clothing, with waist-length coats and waist-length capes of yellow Terran silk commonly worn over the top. Their armour segments were lined with fur, and coats and capes were embroidered with company symbols and other military devices. Helmets were of the spiked variety, often trimmed with beads or fur. Standard issue gear was carried in a lightweight pack, with a long sword-bayonet slung at the waist. Uxors wore black, lightweight variants of the uniform, often covered over with gray cloaks or coats." Legs - Looking at the Arcadian legs from Victoria Lamb, checks the box on the waist-length coats, and the boots and fatigues are suitable enough overall. Granted the book makes mention of bodygloves, but I've not been able to find any leg set that includes both the waist-length coat and more form-fitting leggings. Fatigues it is on that front. Torsos - My first instinct was to go for the full-blown camo cloak torsos VL does (and they are awesome), but the book mentions several times their capes were also generally waist-length, and they generally carried packs full of gear and LiqNite cannisters so I think the Highland torsos with the chem tanks will be just the thing! Arms - The universal rolled sleeve arms should hopefully give the models a bit more of a burly feel (or at least that's the plan). Weapons - The basic trooper in the Five-Two carries a pretty standard lascarbine, and I think the Mk3 laser rifles have a nice RT-era feel to 'em. There's occasional mention of twin-barreled lascarbines in the novel, but I've not found a company that makes 'em as yet. Heads - The heads have been the hardest thing to sort out. Spiked helms that weren't just full-bore pickelhaube were proving tough to find, but I stumbled across the Meridian Miniatures line, and their steampunk prussian heads were just the thing - glareshields and all! Add in a little GS'ed fur and chain here and there and I think we might be in business for the base troopers! Feverishly working on finishing up a 40k Ad-Mech force to get up on the ol' auction block to fund the purchase of the bits - having a 'get to start a new project' goal has been a good motivator to finish up the existing batch of minis! Going to be fun nosing around the dealer room at GenCon for other interesting bits and kits, too! Laid in the basic metal, bone and red on the Skitarii Rangers yesterday evening, quick in progress shot to keep the ball rolling on that project too! I do love to see an ambitious project come together and Mordian you are going big. Well played and it will be cool to see. What are you thinking for transports. Good stuff mate. The book itself didn't really do it for me. Too slow and barely a mention of the Alpha Legion until the last quarter of the story. But, I love the idea for this new project. The image of the Geno Five-Two though, made in miniature and using all the Vic Lamb parts - can't wait! OK, After all this time, now you have my attention. I'm eagerly anticipating this project! 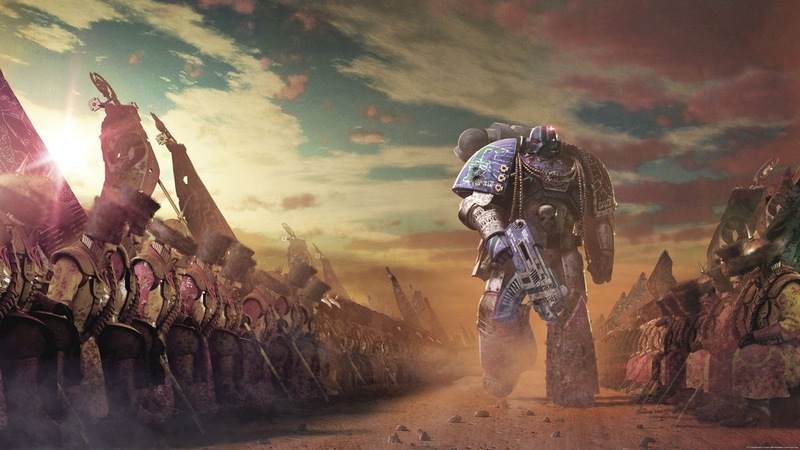 Legion is in my top 5 favourite Horus Heresy novels (along with the first 3 books & Fulgrim) - although the series has become very hit-&-miss I think. IMO Dan Abnett is far & away the best author Black Library has, & the Alpha Legion have long been my favourite traitor legion. I assumed the infantry on the cover were a Geno unit, but maybe not the ones focused on in the book - probably just the artist's interpretation of a description. Thanks for the heads-up about Victoria Miniatures, I hadn't heard of them before, & their ranges look brilliant. @Rory Priest: Indeed! While I enjoyed building the 'out of the box' marines for the Imperial Fists, the modelling/kitbashing aspect of the hobby is something I really enjoy. Been combing the interwebs for interesting speeder models to act as stand-in Arvus Lighters, as it's mentioned that Bronzi preferred 'em whenever possible. There is mention of tracked tanks as well, though thus far I haven't been able to find any specific make mentioned (other than the Centaur, but the Tempest list doesn't allow for their use). @Zzzzzz: Cheers man! Looking forward to getting stuck in - Space Marines are great and all, but my first love has always been the guard! @Pawn Cocktail: Indeed, this is the fourth or fifth listen to the audiobook for me, and I've been re-reading and annotating the dead-tree version for the project. Love Abnett's stuff, and Aaron Dembski-Bowden writes great stuff as well. There is a mini-triumph that Teng Namatjira holds and the book rattles off five or six other regiments (in greater and lesser detail), it may be that I'll have to do a unit from the various other forces mentioned as well - that'll be how the army goes off the rails from "boutique" to "absurd 6000 point monster". :) Can't recommend Victoria Minis enough - been super pleased with the dozen or so orders I've done with 'em over the years!